The story unfolds around Osaka, Japan, with the unlocking of one girl's hidden potential, and a gathering of Young mages whom are destined to change the fate of the Earth. It was a fresh morning in late April. The air was still crisp, and the birds were singing their songs as Ruarc lounged on the bench outside his cottage. Breathing deep, he gave a long sigh as he reached down into his pocket and pulled out a sterling pocket watch to check the time. Noting the time, the Irishman figured the students would be along soon enough. He had volunteered to take over the Practical Application of Magic class while its usual instructor was away on maternity leave, and now waited for his students to arrive so he could start the exercise he planned out. Patting his legs, Ruarc pushed himself off the bench in anticipation. With a few quick brushes he straightened his outfit that consisted of a sage green tweed vest over top of a light flannel button up with the sleeves rolled up and the bottom tucked in. His pants were soft blue denim, a thick brown belt, and light leather shoes. Topping everything off was Ruarc's favorite flat cap. He had even trimmed his hair and beard so he looked professional. "Alright," Ruarc said. "Any minute now." The first to arrive was the slightly taller than average, blonde, and half Japanese Katerina Michizaki. Taught by her business-owning patents to always arrive early to any sort of meeting, appointment, or class, and, as such, she had made a habit of it. "Good morning-" she began, realizing that the groundskeeper was there instead of their normal instructor. "Mister Flynn," she finished, without skipping a beat. It was then that she recalled that Professor Erikson was going on maternity leave. It would also explain the reason why the class was taking place out on the grounds and not in the courtyard or one of the myriad rooms in the manor. "A fine day, is it not, sir?" She asked somewhat rhetorically. The next to arrive was the shorter than average, blonde, and full Welsh Drysi Maelgwyn. Taught by her grandmother, Bledig Maelgwyn, to never waste time by giving to others, she came closer to the expected time. An amount that gave her just enough to prepare. One should always arrive precisely as asked, and leave precisely when expected. Otherwise people would come to expect you to do more for them. When she arrived, she did not say something immediately, but rather began to fish around in her satchel. The leather bag carried all her writing implements, but showed a bit of age and use for a young girls bag. She pulled out her quill, and her inkwell. "Good morning," she greeted them flatly, as if just noticing the two, before testing her ink on the air. The black goo glowed, and hissed, as if displeased not to find paper. Drysi whispered something, reading the inscription, and the grass beneath the lettering began to flatten harshly. She waved the ink away, cause her writings to disperse as if they burned. "Hallo." Vrey stated as she swung the upper half of her body down and caught herself by hooking her legs around the branch she had been sitting on. The upside down teen was gauntleted, be-pants'd, and be-skirted. Her hands were shoved through the slits in her skirt and kept the garment from fluttering down. The bald girl paused and simply stared at everyone before seeming to lose focus and listen to something. When her attention zeroed back on the people below her she nodded to them despite her unorthodox position perched and pivoting about the tree above Ruarc. "The weather is bright for hunting." The last two too arrive were the also slightly taller than average blonde Brit Willow, and the platinum haired Laoise who stood a couple inches above the other girls. The two of them arrived right on time after exiting from the cottage, and each had a small knapsack on. Laoise was dressed in sage green denim pants, knee high leather boots, a white button up with its sleeves rolled up with a suede vest over top, and her silvery hair was slightly curled and hanging loose across her shoulders; Willow was dressed in striped blue leggings, well worn hiking shoes, a thin white zip-up hoodie over an electric blue tank top, and her own long hair had been tied back in a ponytail. Right around the time they were coming outside, Vrey had made her own entrance above Ruarc. Looking up at the odd girl, Ruarc had been wondering when she was planning on popping out of the tree. "Right ya are, Miss Vrey," Ruarc agreed, his mood seemed rather upbeat this morning. "An' now that everyone is here, we can start into class. As ya lot have likely figured, Ah'll be takin' care of Pracs Class while Erikson is away. An' seein' as it is such a fine mornin', figured it would be a good chance for a nature hike." The druid made a broad sweeping gesture with his arm to divert attention towards the forest that covered a fair portion of the mansion grounds as the land stretched off into the rolling hills. "This will help ya become familiar with the grounds around campus, the wildlife of the area, and since this is a class after all, Ah've structured it to involve a game that will test each of your personal abilities." Reaching into his shirt pocket he produced a handkerchief that was emerald green with a gold paisley. With a flick of his wrist the small square unfolded. "Your goal will be to find me out in the forest, and get this handkerchief from me. Think of it as part scavenger hunt, part tag." Pausing for a moment, he tucked the unfurled fabric into one of the belt loops of his jeans. "Laoise will be taggin' along with ya, so iffen ya get stuck, lost, or have any questions, she can help out. Though Ah expect all o' ya should be fine. The clues will be general landmarks, trails, and signs Ah'll leave behind suggesting where Ah went' and obstacles will be various things that you should use magic to handle. And, Willow will have this." Holding up a rune stone, Ruarc showed the girls before tossing it to his apprentice. "That is your test Willow. That rune, if you can activate it, will tell you exactly where Ah am. So, any questions before Ah take a five second head start?" "Does that mean our success largely hinges on Willow?" asked Drysi, she stomped around in her own hiking boots, and an outfit that was fitting for the outdoors. The Welshgirl seemed to favor shorts for these kinds of outtings. Other than her three-eyed glasses, which shined in the sunlight, she appeared somewhat unremarkable. Despite having spoken to them, she seemed more concerned with what was in her pack, "I will be sure to work extra hard to support her." "Teamwork will probably be more important. Even if Willow finds Mr. Flynn's exact location we still need to get there and catch him" Katerina pointed out, shuffling the small bag on her back to get it settled in just right. Her gear was fairly modest on the surface, not flashy or showy, but everything she wore was name-brand from companies that didn't even do business in Japan. She did seem ready to go, regardless. Before they took off, heavy footfalls in the grass would draw their attention away from the woods. A young man dressed entirely black was running their way with a strange dog in tow. When he finally caught up to them, he planted hands on his knees. His lungs labored to draw big breaths within. After a few moments, he drew one exceptionally deep breath and straightened. Hazel eyes fixed on Laoise. "I'm sorry, Miss Erikson!" Up close, he and the dog were a strange pair indeed. Nevermind that his attire was utterly onyx, it was also long-sleeved despite the pleasant weather and included a turban of sorts that hid his right eye and half his right ear. This, of course, was the second strangest thing. The absolute strangest thing was his dog. It was most certainly dead. Or, at least undead. It stood calmly, a soft blue glow within the hollows of its sockets and jaw bone lax. It panted, though why was hard to imagine: it no longer had need to cool itself, or a tongue to do so. Perhaps it was merely an ancient reflex. He explained himself after a few more recuperative breaths. "I'm new, and I didn't know we had classes outside. Won't happen again." Johann Krieger glanced down at his dog at that moment and was reminded of the other thing he had been meaning to mention. "Oh! And since it's like a magic PE class, is it okay if Chuffy comes too? He's the best behaved, I swear! He loves people!" Johann pet Chuffy's exposed skull and scratched behind his ears. Chuffy looked up at his master with all the joy his monotone bones could express. Tilting her head, though still upside down, Vrey felt a slight curiosity beckon itself awake while taking in the group's newest arrival. Letting her legs straighten the short figure fell from the tree and landed solidly on her shoulders and neck where the rest of her body soon slumped into contact with the ground. Twisting about in the heap she was in - dirtying herself in the process - the hairless teen dug her chin into the soil as her eyes stayed focused on their black garbed fellow. When the boy introduced his skeletal companion Vrey's body bunched up and then was gone - the girl herself squatting by Johann with her attention being spared to nothing but the dog. Animals did not like her. "I am not people." Vrey stated in a monotone as one eye flashed green and the other stayed grey. The skin around the illuminated eye rose up in twisting worm-like veins. Spirits did not like her either. Reaching a gauntlet'd finger out Vrey tapped Chuffy on the tip of their bony snout. Once physical connection had been made between her and the hound the girl threw a thought forward. Willow turned at the sound of a new arrival, and simply stood stock still as she processed what she was seeing. In the time she had been at Safeholme, the Brit had had practice at taking what she saw with a grain of salt. After all, what was new and bizarre for her was standard for everyone around her. So when the tall boy in black showed up with a half decayed dog, Willow had to catch herself from gasping. Almost unconsciously, she shifted slightly to strand a bit behind Laoise. Laoise, for her part, held her graceful composure as she registered that it was thought that she was someone else. Putting her hands up evasively, the familiar waved away the notion and diverted attention over towards Ruarc. 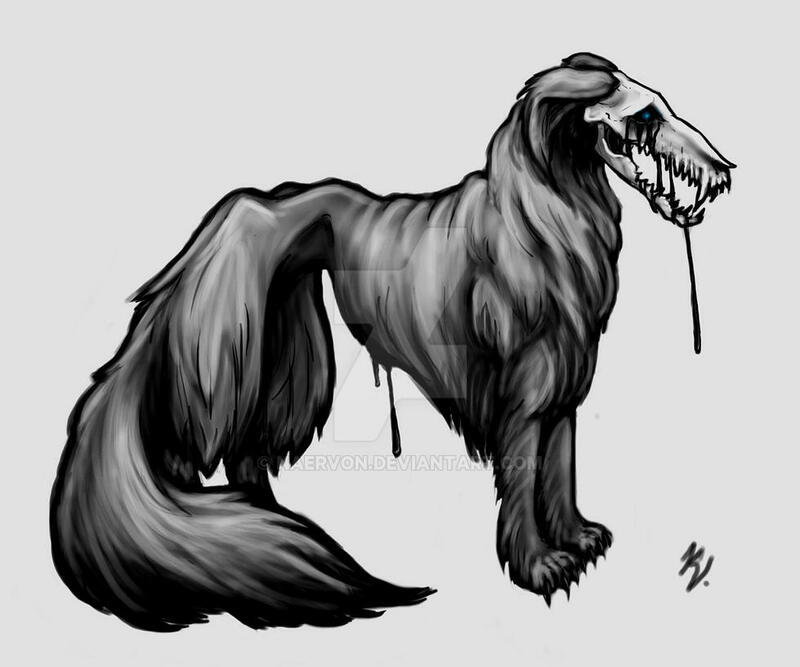 "Missus Erikson is off having a baby, that is my assistant Laoise Flynn, and Ah'm the instructor; Ruarc Flynn," Ruarc corrected the lad as the boy walked in with what was plain to see as an animated corpse of some mixed breed hound. He didn't recall hearing about a new addition, but then again he also hand't checked his email in a while. "Anyway, you're just in time. Ah'll apologize, Ah wasn't aware of your arrival, so how about a quick introduction before we kick off the hike. We've heard your, uh, dog's name, so what's your lad?"